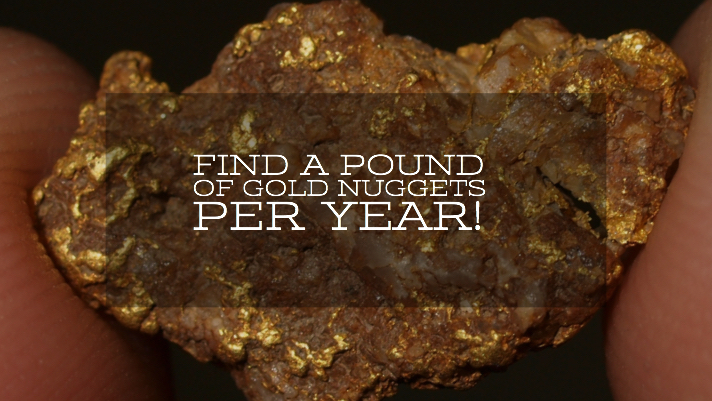 Home > Find a Pound of Gold Nuggets per Year! One of the fun things about this business is getting the chance to speak with some truly skilled gold prospectors and miners. Over the years I have had the pleasure of meeting several guys who seem to have an uncanny ability to find gold. I had the chance to buy a few ounces of nice gold nuggets from one of these prospectors a few weeks ago. Almost all of the gold that he finds is by metal detecting in various states in the western U.S. He has found a LOT of gold over the years. In fact, for the past several years he has found OVER a pound of gold every year! That is over 12 troy ounces of gold (and some years were quite a bit more than that), a real accomplishment for anyone. And this is primarily from metal detecting, not from an established mining operation or anything like that. Just a guy with a metal detector, exploring the goldfields of the West. He agreed to let me interview him about his success over the years. Despite being one of the most successful gold prospectors I know, he is far from arrogant. He doesn’t post on the gold forums and he doesn’t share his finds or success with a whole lot of people. I grew up in the country, so I was always interested in anything that I could do outside. We didn’t have a lot of gold right around my house, but I would bring my prospecting gear when the family went on weekend trips. Nothing fancy, just gold pans and sluice box. When I was a teenager and had a truck I was able to get out and start hitting some of the better gold areas. This was when I really got interested in gold mining because I started finding more gold than just a few specks of dust here and there. Now, I know that you mostly metal detect for gold nuggets these days. When did you get interested in metal detecting? Pretty early on. I met a few other prospectors that did it, and once I saw that they were finding big nuggets I knew I needed to get one! Before that I was just finding small stuff, fine dust and maybe a little picker now and then. What was the first metal detector you used to hunt for gold? I started off using the original Gold Bug detector. It was a hot little detector that I found plenty of gold with. Of course back in those days the better goldfields hadn’t been hunted very hard yet so you could find quite a few nuggets without much effort or skill. I did get pretty good with that old “bug” though and those are still a good detector. I imagine you’ve used quite a few detectors over the years. What are you currently using? Oh yeah, I’ve used lots of them over the years. 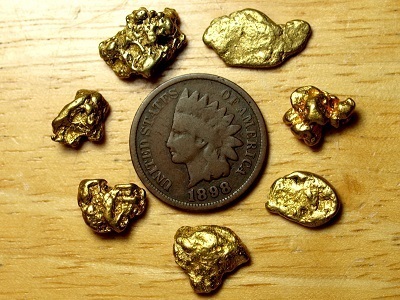 Most any gold detector will find nuggets if you learn how to use it. Of course the big challenge is in hot ground. I’ve used the White’s GMT, Fisher Gold bug 2, Garrett, Tesoro, and several models of Minelab detectors. These days I am using the Minelab GPX 4500 and a Gold Bug 2. That Gold Bug is still the best detector out there for small gold, but the 4500 is what I use most of the time. There are some newer Minelab detectors like the GPX5000 and GPZ7000 out now. Have you had a chance to use those? I have some friends that use them. They are pretty expensive and I haven’t decided to upgrade yet. I know they are good detectors though… I am just so comfortable with my GPX 4500 that I don’t feel any need to get anything new just yet. Now it seems like every time I talk to you, you are somewhere different. Which states do you like to metal detect for gold nuggets? Yeah, I definitely travel a lot with the weather. I also just like exploring new areas. That’s half the fun of metal detecting! I have found gold in every state in the West except for New Mexico and Colorado. I’ve been up to Alaska a few times and also British Columbia. There are good areas to hunt in all the western states if you do your research. I primarily pick my hunting spots depending on the weather. In the winter I am in Arizona and southern California. In the summer months I am usually up in northern California, Nevada, and Oregon. Have you got a favorite area to hunt? Ha! Well I guess that would be the areas where I find the most gold! I really like northern Nevada. It’s just so isolated up there, not very many people and lots of open ground for prospecting. California is still good though, it’s just more effort to find open ground to hunt, but there is still good gold there. I always hear guys from California complaining about how everything has been “hunted out” but there is still a ton of gold in that state. And some big nuggets too! Oh for sure. Those little nuggets are the bread-and-butter. You can’t go out expecting to find the big chunks all the time; they are just fewer and farther between. Get good at finding the small nuggets and the bigger nuggets will show up, but if you only wanted to find big nuggets you will be a lousy gold hunter. You bet. I talk to a lot of newbies that have delusions about what metal detecting for gold nuggets is really like. They expect to just go out into the mountains, start swinging their detector, and start digging up piles of gold. Yup, I’ve meet plenty of those guys. They think they are going to just buy a detector and start making a living finding gold. Most guys that prospect, whether they’re detecting, dredging, highbanking, whatever, usually live a pretty meager existence. There is nothing easy about it. But you are doing this full-time right? You could say that, but I also have a retirement and some savings. I’m not depending on the next nugget to feed myself. I think that is the difference between me and a lot of miners that I meet who pretty much sell every crumb of gold they find just to eat. I am glad I’m not in that position. Plus, I think it makes me a better prospector not being stressed about making my next payment with gold money. I spend a lot of time patch hunting for nuggets, and that can mean that there are lots of days when I don’t find anything at all. If I needed to find a piece of gold just to eat, I’d probably go back to one of the pounded goldfields and look for small nuggets with my Gold Bug 2. That is fun, but you don’t usually find anything too good pounding the same worked out patches over and over. Any recommendations for the new guy who wants to get started finding gold with a metal detector? Well, make sure you are hunting in a place that has gold nuggets. Lots of gold districts don’t really produce much in the way of nuggets, so a metal detector isn’t going to do much good. 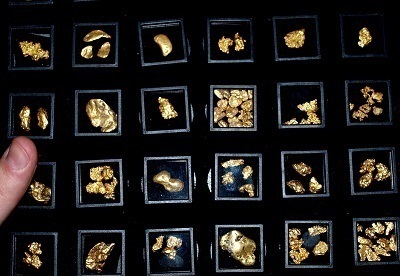 Even some places that produced millions of dollars in gold don’t have many nuggets. This is all part of research. 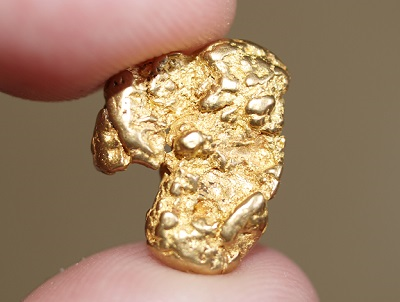 Read information on different areas, and find places that gold nuggets have been found before. If nuggets were found by the old-timers, there are still some left for you and I to find. Geology is the other thing that so many people overlook. The historic workings get easy to identify after a while and most guys know that it’s a good place to hunt for gold around the old diggings, but you really need to think about what it was about the area that made the old-timers start mining that area in the first place. That’s how you will find those virgin patches. Each area is different and can take some time to learn how to hunt effectively. It’s all about learning the geology of the area and how it relates to the associated gold deposits. I’ve found a lot of my patches just looking out the window of my pickup and spotting a geological indicator that made me think that it looked pretty good for gold. Lots of those places I picked up the first nugget in just the first couple minutes of detecting… but I never would have stopped if I hadn’t been able to recognize that good looking ground. Anything other tips for the new guy? Get a gold specific detector. The Gold Bug 2 or that new Gold Bug Pro are pretty good detectors that aren’t too expensive. But there are plenty of other good ones. Just get one that is made specifically for hunting gold… not a coin detector or “multi-purpose detectors.” Some of those multi-purpose detectors are OK, but they just aren’t as sensitive as a detector like the Gold Bug 2. If you really want to find nuggets, why not get a detector made for the job? Pretty much all the pros are using Minelab Pulse Induction metal detectors. Like you mentioned earlier, there is that new GPZ 7000 and that new SDC 2300 is also a good unit. I am still using the Minelab GPX 4500 and plan on keeping it for the foreseeable future. One thing that I like about it is that there are so many coil options for the GPX detectors.